Aerodynamicists use wind tunnels to test models of proposed aircraft. In the tunnel, the engineer can carefully control the flow conditions which affect forces on the aircraft. By making careful measurements of the forces on the model, the engineer can predict the forces on the full scale aircraft. And by using special diagnostic techniques, the engineer can better understand and improve the performance of the aircraft. The wind tunnel test is controlled from a separate building called the control room. There are three main functions that are performed by teams of engineers and technicians in the control room. One team controls the operation of the wind tunnel. They set the speed of the fan and monitor conditions in the test section. Should any emergency arise, it is their job to bring the air in the tunnel to a stop as quickly and safely as possible. Another team of engineers control the aircraft model. Many models employ variable geometry or the model itself may be maneuvered during the test on its mounting. This team also monitors the operation of the diagnostic instrumentation present on the model. The third team usually performs some preliminary data reduction for the test. The results are compared with pre-test predictions to uncover any possible problems during the test, or to guide the selection of future test conditions. The size of the control room and the number of engineers and technicians present during a test is usually related to the size of the tunnel and the complexity of the model. 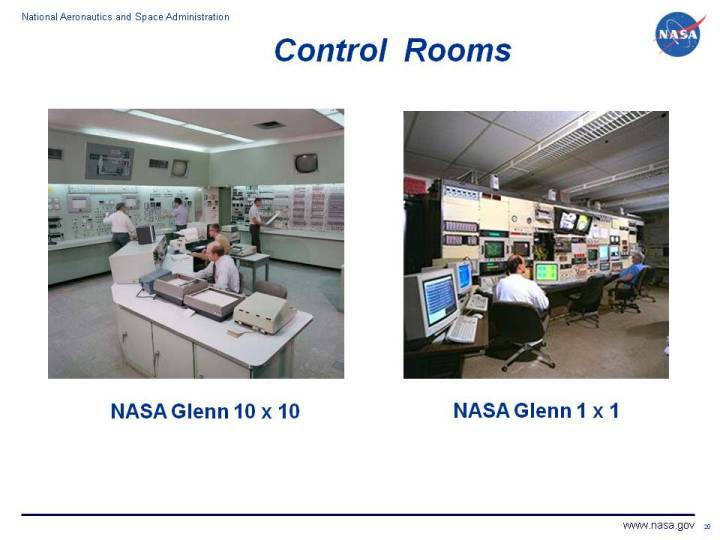 On the figure at the top of this page, we show two control rooms at the NASA Glenn Research Center. The photo on the left is a picture taken in the early 1980's of the 10x10 supersonic wind tunnel. The photo on the right is a picture taken in late 1990's of the 1x1 hypersonic tunnel. The tunnel designation describes the cross-section of the test section in feet. There are five engineers shown in the 10x10 picture. The two at the back left are controlling the tunnel conditions, the one at the back right is checking instrumentation and the two near the front are looking at data. There are only two engineers in the 1x1 control room because the tunnel and models are smaller and much more simple to operate than in the 10x10. Modern computers have also lightened the load for wind tunnel engineers and technicians.